Polycarbonate resins are tough thermoplastics usually derived from bisphenol A and phosgene. Polycarbonate resin was commercialized in the early 1960s and is now the second-largest-volume engineering resin produced, following crystalline nylon. Polycarbonate is an amorphous, very clear polymer with exceptionally high levels of impact strength and ductility, as well as inherent fire resistance and useful engineering properties over a wide temperature range. It has good resistance to UV light, although it has a tendency to yellow with long exposure. UV stabilizers have overcome this problem to some extent. Polycarbonate resin’s unique combination of properties make it a material of choice in applications needing impact resistance. It outperforms similar transparent polymers available on the market, such as polymethylmethacrylate (PMMA). Its toughness, combined with transparency and high-temperature resistance, make polycarbonate a perfect candidate for demanding transparent applications where safety is a factor. These attributes allow polycarbonate to be used in a wide variety of products including electronic equipment, automotive parts, construction glazing, greenhouses, digital media, exterior lighting fixtures, sports safety equipment, and medical devices. 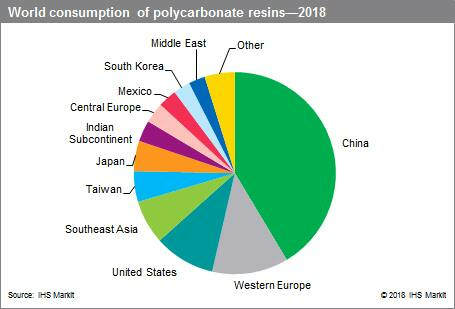 Northeast Asia is the largest consumer of polycarbonate resins and will be one of the fastest-growing regions, driven by the growth in China. The next-largest markets are North America (led by the United States), Western Europe, and Southeast Asia. During the 1990s, polycarbonate delivered double-digit annual consumption growth, but growth has slowed to less than 6% per year over the last 20 years. The relative size of the market sectors has also changed over the years. The largest markets for polycarbonate resins are electrical/electronics (including computer and business equipment), followed by sheet and film, and the automotive industry, including window and nonwindow applications. Consumption in most countries/regions is not dominated by any single application; however, the largest market varies— in the United States, it is automotive/transportation; in Western Europe, it is sheet and film (used in building and construction); and in China and Japan, it is the electronic/electrical market. Polycarbonate consumption in the electronics/electrical market is influenced by consumer demand for communication and entertainment devices including mobile phones, personal computers, flat-screen televisions, cameras, network equipment, and printers. The potential challenges in this sector are the short life cycle and shrinking size of the devices. However, the trend of new designs to use less material will be more than offset by a higher volume of electronic products. Growth will be driven by developing markets where there is demand from the large group of emerging middle-class consumers, such as China, India, Southeast Asia, and Brazil. Polycarbonate’s use in the production of optical discs is based on its excellent dimensional stability and optical properties. Prior to 2011, optical media was the largest consumer of polycarbonate resins. However, the continual shift from audio CDs, DVDs, and Blu-ray discs to music and video downloads and from CD-ROMs to digital and cloud storage technology has led to a steady decline in consumption of polycarbonate resins for optical media. This decline is projected to continue through the forecast period. Polycarbonate is also a lighter, safer alternative to glass in optical applications, such as corrective lenses. There will be a continuing need to develop improved PC resins for the growing medical/ophthalmic applications and optical lens markets, including digital camera lenses and other uses requiring a high refractive index and low birefringence. Covestro and SABIC Plastics are the two largest polycarbonate producers worldwide, and they are forecast to remain so over the next five years. These two companies are the original inventors of polycarbonate resins (as Bayer and General Electric Plastics, respectively). High barriers to entry into the polycarbonate resin business will persist because of the requirement for a large initial investment, access to technology licenses, possible start-up difficulties, and the establishment of efficient and effective marketing.